It is Sky Watch Friday again! Or there are 40 minutes left of it actually! The day went in a whirl. One thing is certain, I do not like to pack. We are leaving for a short mountain trip tomorrow and as usual nothing is packed. But then we are going in the evening. So there is time to do a sky watch post quickly. While I was thinking about the post, I realized that I do so many mountain collections but I hardly ever do beach collections for Sky Watch. So I am setting it right today. Isn’t it a thing of beauty? 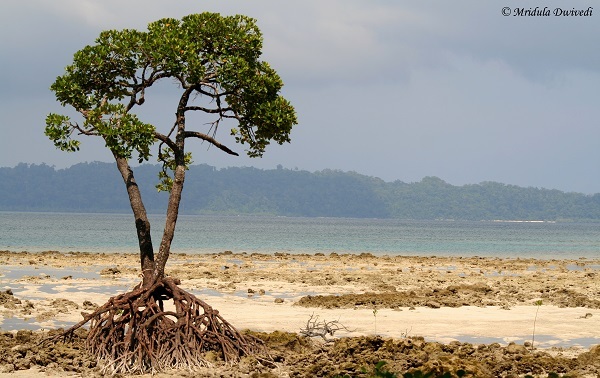 Havelock was a memorable destination for me. The first where I went scuba diving. Even otherwise, it is stunningly beautiful. This was just behind my hotel, Sea Shell. I remember that they used to put coconut water in water containers! And what fun it was. I will also remember Havelock because it was the place where my camera met a very watery grave! 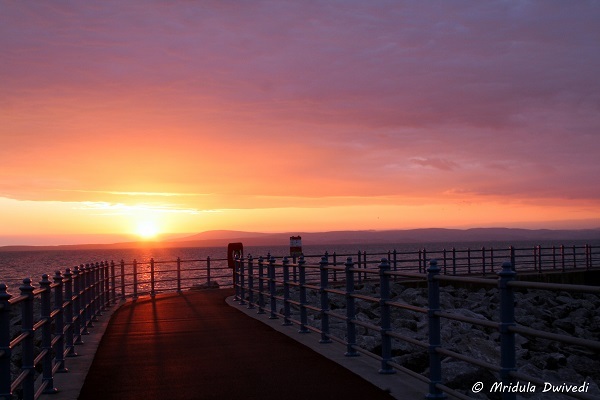 I visited Heysham and Morecambe because they were close to Lancaster where I used to go for work. UK is the only place I have visited where beaches are cold! All my walks were done wrapped up lightly even in what they call summers! But those were pretty walks! 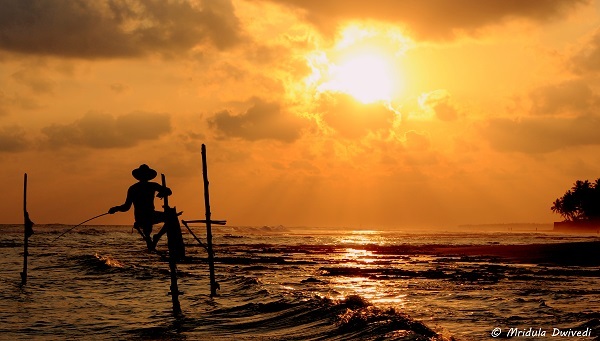 I saw a stilt fishing photograph on the cover of a HR text-book first! 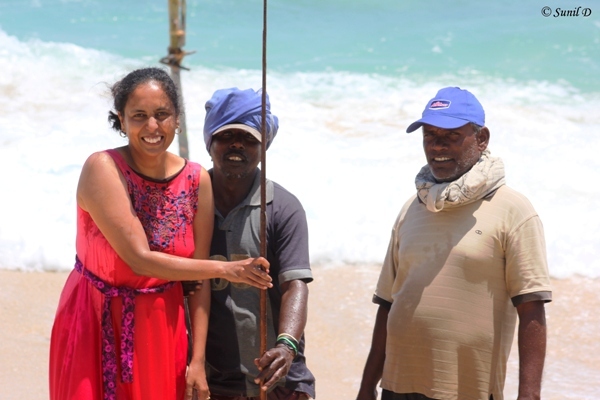 And then I went to Koggala where stilt fishing is done. It is quite touristy. The fisherman ask for money upfront if you wish to take pictures. But I still enjoyed it a lot. 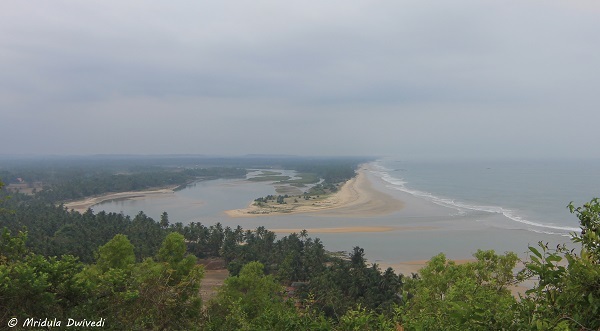 I saw the beauty of coastal Karnataka on my recent trip to the region in May. This was also a first, when I saw sea meeting the backwaters. 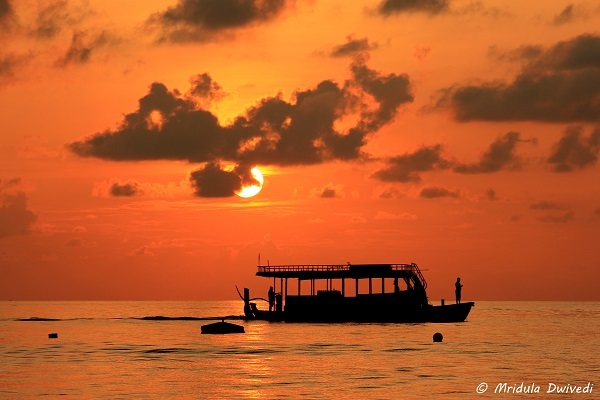 My most exotic beach vacation has been to Maafushi Island, Maldives. It was stunningly beautiful. I wish I get to go back to that enchanted land once again! 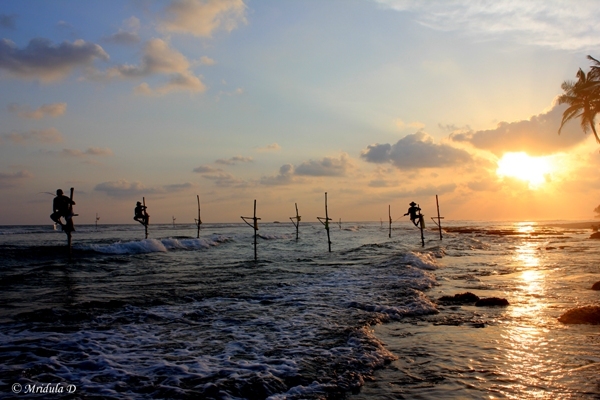 I was intrigued by the pictures of stilt (also known as stick) fishing I saw before leaving for Unawatuna in Sri Lanka. 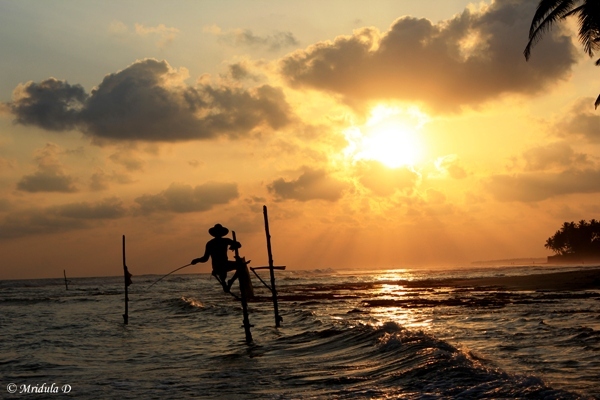 Watching stilt fishing was surely on my agenda . 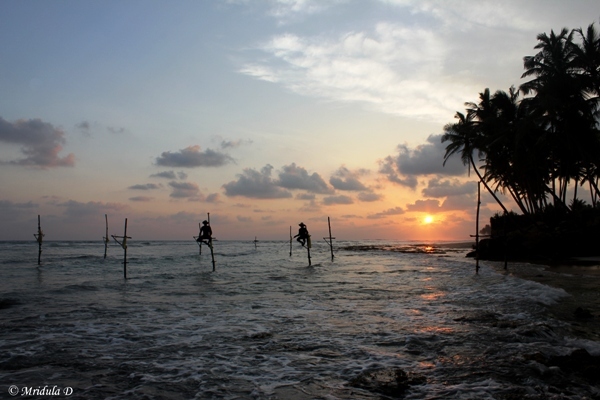 On our second day we decided to head to Mirissa beach. 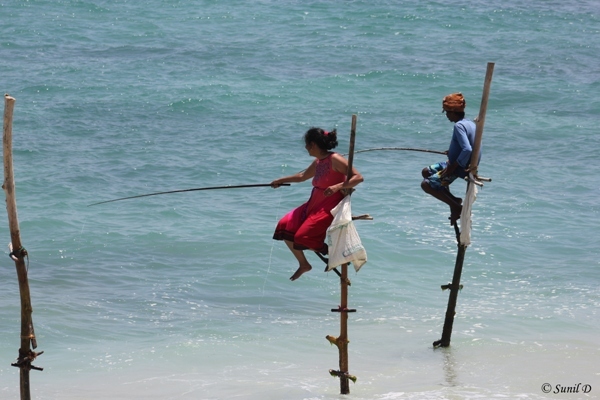 When we saw Stilt Fishing near Koggala we asked our tuktuk driver to stop. I have recounted that experience in detail in another post (linked above). On our last day in Unawatuna my nephew wanted to laze around on the beach and I was in two minds. Half of me wanted to go back to the stick fishing area and click the activity at sunset and the other half told me to forget it as I had already done it. Then I asked myself a critical question, “would I regret it later if I did not try to click it at sunset?” The answer to my own question was an unequivocal yes. So my nephew went to the beach and played football and I went in search of stilt fishermen again! We stayed at the Thaproban Beach House and a few tuktuk drivers would always hang around our hotel. We got quite friendly with them during our stay. One of them drove me to the area. There were 4 fishermen near Koggala and when we stopped our tuktuk, the driver was once again quite apologetic saying they would ask for money. I told him not to worry, I already knew it and I was prepared to deal with it. After our first encounter I went on asking around about the reason of the fishermen using sticks. I was told that this way they are sitting like a bird away from the fish and it is easier for them to catch it. I am not sure how true this is but it felt like a reasonable explanation. Then I asked the same question again to a waiter and he said, “it is all for the tourists, small fish do come in some months but these days it is done mostly for the tourists!” Now I was really confused. I was also told that the stick is made of stout wood and can stay in the water for up to one year without decaying. But after an year it usually needs to be replaced. 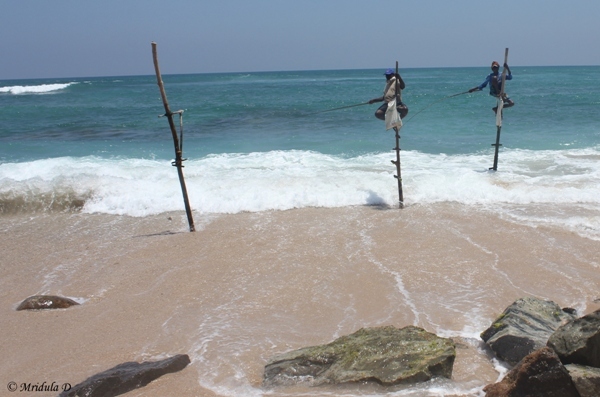 So I paid the fisherman on the ground some money again and he let me click pictures of the three fishermen on stilts. I was not getting a good angle from the beach so I decided to enter the water with my camera again! The fisherman on the ground helped we to find my way and I was really thankful to him because I did not wish to take another expensive dip in the water with my camera. And so much so for my resolve for not taking my camera near water again! While I was taking pictures a pair of tourists came along. I told my fisherman to go and talk to them, I would be fine by myself. That pair of tourists were surprised when they were asked to give money to take pictures. But in the end they did give something. My fisherman came back again and stood by me. Before going he had pointed a black ugly creature in the water with protruding sharp fins and they were still lurking around. By this time the sun had gone behind the clouds and I told him that I wanted to leave. They also offered that I could go and sit on the stick but I told them I had done that before. I requested my tuktuk driver to ask a few questions on my behalf as the fishermen didn’t speak much English. But the session didn’t go too well. When I wanted to ask how old was the activity I was told they started in the morning, they took a few hours break at the noon and then came out again in the evening. After a few such attempts I gave up. In the end the experience did seem to be more for tourists and less about fishing. I also feel we tourist are so crazy about the photographs that the fishermen have sensed a business opportunity and are using it as such. When I was about to leave they asked me (in a few broken words) if I was from India? When I said yes they asked me what was my age. When I quoted four decades they were quite surprised. Then they asked me if I had kids. I told them I have a daughter. The next question was if my family was around and I said no. My nephew was not there and it would have been a long explanation anyway. They thought I was a weird Indian woman going around without my family! Will I do this again? For sure I will, the money they asked for was a small amount and they were genuinely concerned about me when I went into the water with my camera. But it did leave me wondering about the impact of tourism. I am not judging it but it has left me wondering for sure! 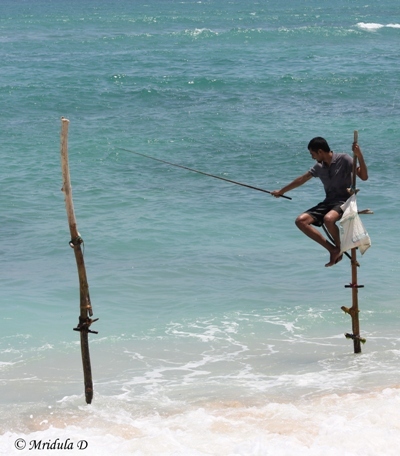 Even before going to Unawatuna I knew about stick fishing and I was completely floored by those pictures. So I was on a keen lookout for stick fishermen in the region. I got my opportunity today. 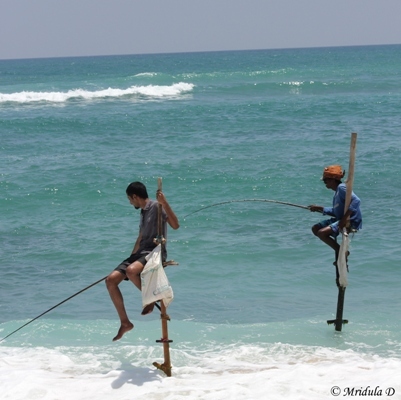 We were going to Mirissa Beach from Unawatuna and even though it was mid day we saw two fishermen on their sticks. So we asked our auto driver if he would stop? He parked by the road and my nephew and I ran to the spot. The first question asked by a local fisherman, standing by the beach, was if we would pay money, all in sign language. So yes the activity is a bit commercialized. I was willing to pay and 200 Sri Lanka rupees (100 Indian rupees passed hands). My auto driver was very apologetic and said it was not like that. But as tourists kept coming, they would pay on their own and then the expectation built. I was content with a few pictures but my nephew had other ideas. He asked in sign language if he could go and sit on the stick and the fishermen were quite willing, They helped him climb up that stick and soon he was perched there, fishing rod in hand and all! My Nephew Tries his Hands! Later he told me that he asked fisherman what if the stick snapped? The fisherman told him he will fall but he would still be fine. In fact the stick next to him in this picture is a broken one. He remained perched there for quite some time! And all of us had a good laugh! When he came down we saw he had minor cuts on his feet and everyone around was quite concerned. My nephew told me that the steps leading to the top were slippery. Then the fishermen turned to me and asked if I would like to go? I never refuse an adventure when it comes my way. Soon with the help of a fisherman I was there, on top of the stick with a fishing rod in my hand. I giggled like a school kid. The fisherman sitting next to me asked me if I was from India. When I said yes and he asked where from (all in broken English and sign language) and I said Delhi. It was a pity that they don’t speak English and I hardly could converse with them. They were happy that I did not pose too many challenges while getting up or getting down. I am also privileged that I got to sit on that stick. Traditionally the territory remains in the family and is passed from father to son. When I was getting down the fisherman next to me escorted me out and the other person stood near the rocks so that I would not get any cuts like my nephew. Did we catch any fish? Well no, but in that duration neither did the fisherman! This last picture was on demand of the gentleman who escorted me out. And I guess my grin tells it all, it was such fun. If my nephew was not there I don’t think I would have asked to do fishing and what fun I would have missed on!